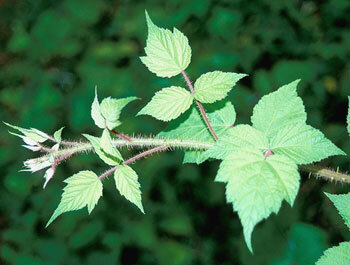 Unlike the one pictured above, the wineberry branch that struck me didn’t have any of those pesky leaves to slow it down. I was hit by a thorn-covered whip, right across my left eye and nose. It moved so fast, I didn’t have a chance to blink. When all was said and done, there were five thorns in my eye: one in the pupil, three in the iris and one in the white of the eye. This necessitated a trip to the eye doctor, who referred me to a specialist, who in turn referred me to another. The first two didn’t feel confident removing the one that was very close to puncturing the eye. It sounds worse than it feels, but they had to numb the eye and remove the thorn-splinters with a pair of tweezers. The one in the white of the eye was the smallest and last to come out. Unlike the others, it was problematic, so he pulled it and snipped the skin of the eye. Did I mention I’m squeamish? Anyhow, so began my daily visits to the eye doctor. I was placed on antibiotics, but the big worry with plant-related eye injuries is the potential for fungal infection. So far, no mushrooms, but my eyesight (and sensitivity to light) was off for days. Still a bit blurry, actually. The fortunate bit to this whole thing… if the branch was an inch longer, it would have hit both eyes. If the thorns were just a bit longer, the eye would have been punctured. If there were more spores on the thorns, I might have ended up with eye mushrooms. In two weeks, I’ll find out if I’ll need glasses. At the moment, my other eye is compensating for the one that is slightly off. If that’s the worst of it, my luck has once again proven its weirdness. PSA: Doing yardwork? Wear glasses. Don’t be stupid, like me.